This stock came up on my radar the last week of February when it rose on “new orders” as it sees increased demand for it’s products in the alternative energy field. I don’t generally look at stocks under 500k/day but this one is on the cusp as it’s adv is now 450k. The chart pattern is very bullish after breaking out of a five month base. Combine that with a screaming high RSI and this looks poised to benefit from the big moves in other stocks in this sector like PLUG, BLDP, & FCEL. 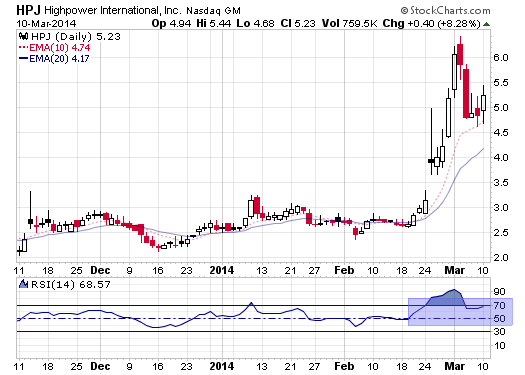 Disclosure: I have a small speculative position at $4.97 and will look to exit as it trades back near previous highs.